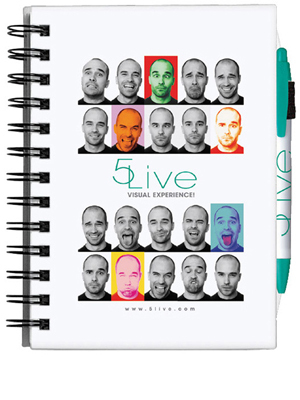 4-Color Process (4CP): $50 set-up charge includes a 4-color process imprint on the notebook cover. Stock backgrounds available. To add a free stock background please be sure to specify background name on your order. For available stock backgrounds please visit www.bicgraphic.com and click on Notebooks. See diagrams for imprint areas, location and number of colors.